Aston Villa (0) : - . Man Utd (3) : Danny Welbeck[15';18'], Tom Cleverley[52']. Guzan, Lowton, Clark, Baker, Luna, Westwood, El Ahmadi, Sylla, Albrighton, Agbonlahor, Benteke. Substitutes : Steer, Bacuna, Weimann, Bowery, Gardner, Tonev, Kozak. De Gea; Rafael, Jones, Evans, Evra; Valencia, Cleverley, Giggs, Januzaj; Rooney, Welbeck. Substitutes : Lindegaard, Ferdinand, Fabio, Young, Büttner, Fletcher, Zaha. Assistants: A Garratt and R West. 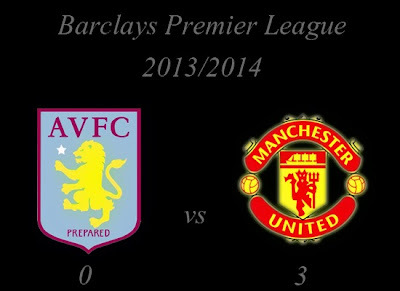 How do you think about Barclays Premier League : Aston Villa vs Manchester United?